In 1998, the University of Rochester was the first major university to develop an American Sign Language (ASL) bachelor's degree program. While many ASL programs now exist, very few have the history and instructional depth found at the University of Rochester. We offer a major, minor, and several clusters in ASL. Our program focuses on modern language, literature, and culture, and approaches the study of signed languages from a linguistic and scientific perspective. Students can explore different research areas—from the true universals of language and language variation, to ASL’s developmental and neurological origins—through coursework and independent study. Our program offers practical preparation for people entering a variety of professions, including researchers, counselors, medical professionals, government specialists, program administrators, community service personnel, deaf educators, and sign language interpreters. Because the city of Rochester has a large Deaf population, students have a unique opportunity to learn and use ASL outside the classroom. Students in the more advanced ASL courses have the opportunity to attend community events, theatrical performances, and lectures. Students also have the opportunity to study abroad. 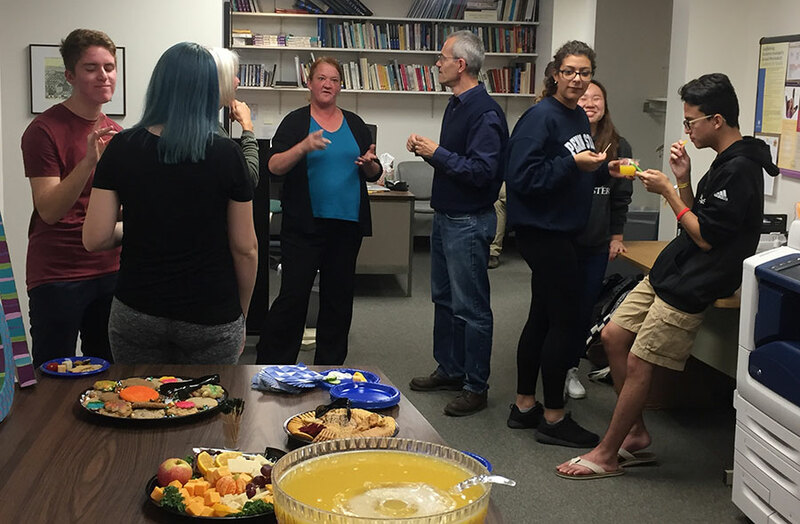 Alumni, former staff, current students, and faculty enjoy food and conversation during our open house.